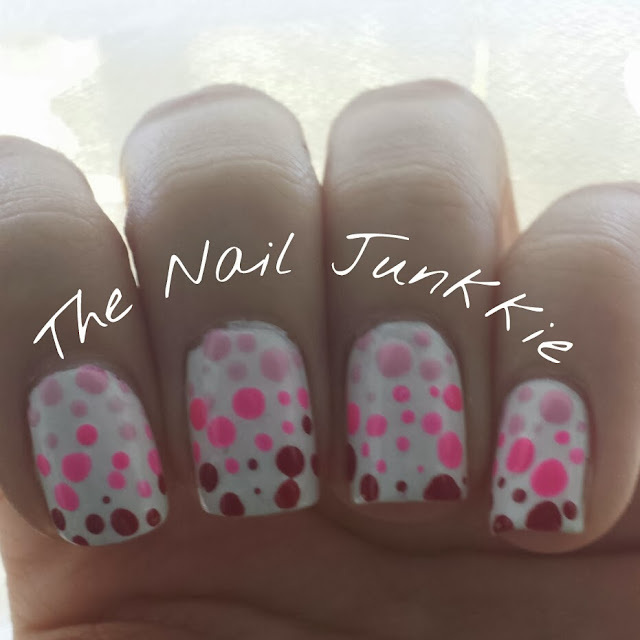 A blog all about my hobby and passion: Nail Art! Spring is my favorite season. Simply because of all the new flowers and beautiful foliage that starts blooming and immediately makes the world a better place. 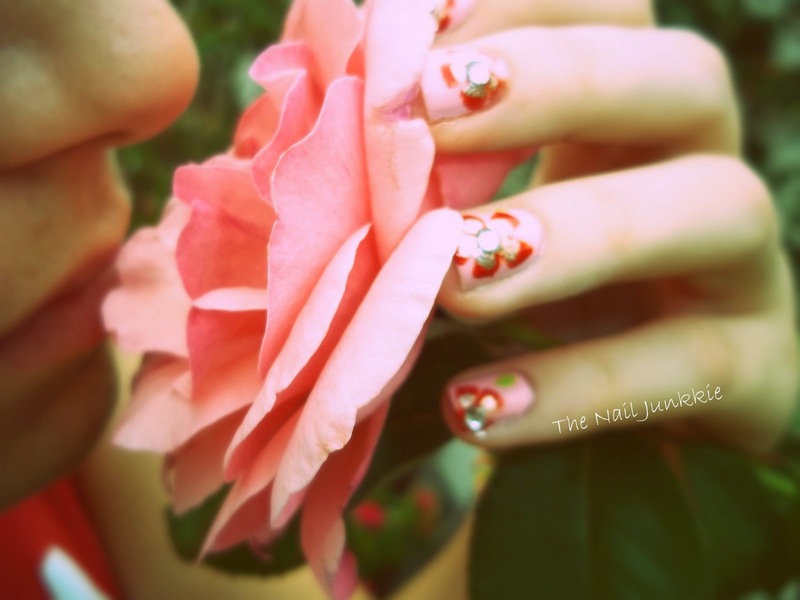 What better inspiration for nail art than flowers? I live in a fairly green community with lots of blooming plants in the spring time. Here's some lovely flower-spiration to brighten your day, I always photograph any pretty flowers or plants I see. I used a really soft baby pink and free-handed the flowers and placed shiny rhinestones for an extra sparkle. I was listening to one of my favorite songs by Two Door Cinema Club called "Sun" when I was doing my nails last night. The song and video clip have something to do with a day out at sea, so it just gave me some inspiration for my manicure! 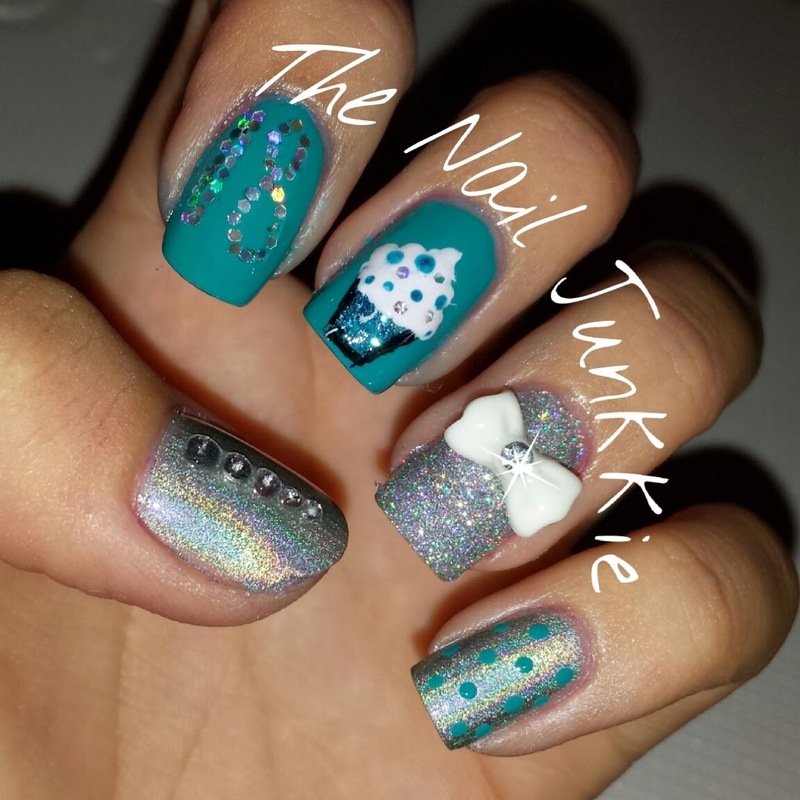 I started out with 3 coats of the beautiful shimmery Tiffany blue from Sinful Colors called "Cinderella". After those coats dried, I layered on a stamp from Bundle Monster (plate m63) with a beautiful metallic blue that I bought from Istanbul last year. 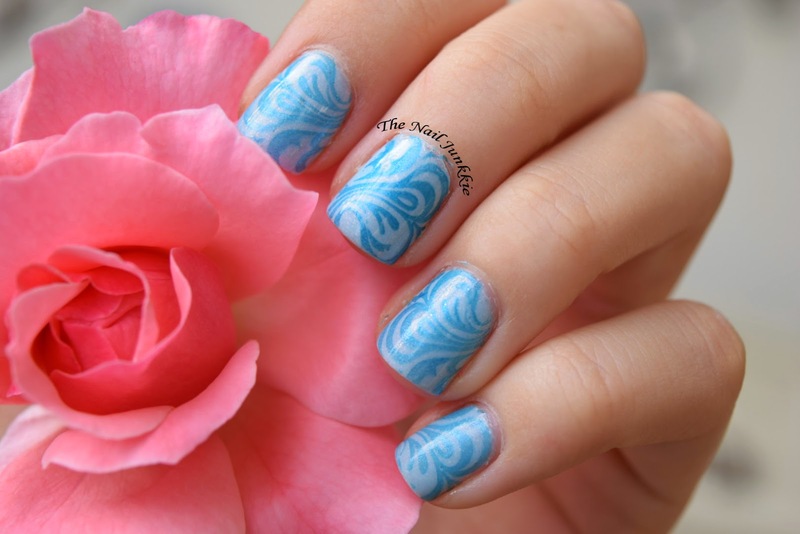 Check out my YouTube tutorial about stamping here! I've been taking advantage lately of the phenomenal fall weather we've been getting to do a bit of photography outside in our yard. Photos just look so much better outside under the sunshine. So, everytime I do my nails I just run right outside with my giant camera and a few props to have like a 20 minute photoshoot. My dad thinks it's very very strange and gives me this look. Anyways, I loooooved how cute this manicure turned out. I had been wearing dark and boring manicures for a few weeks now so this was a very refreshing change. 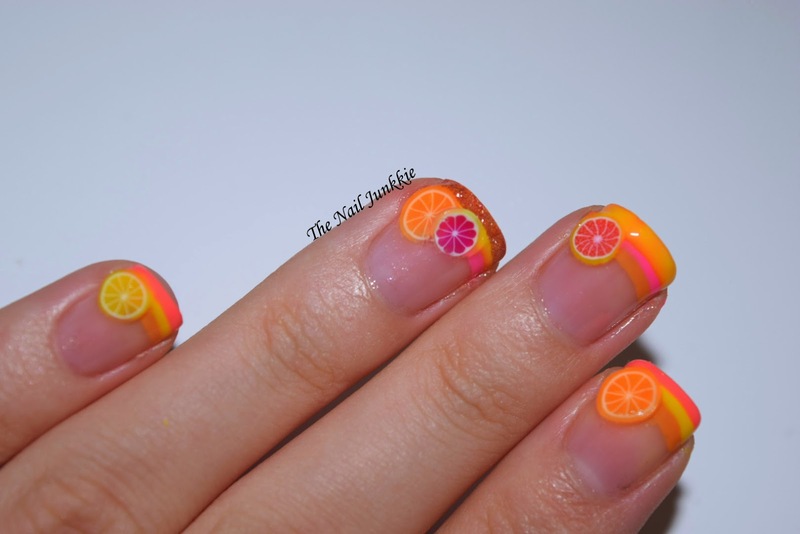 I also really missed using my cute little Fimo fruit slices! Aren't they adorable? I only used citrus fruits this time but I will definitely plan a manicure to use the watermelons and also the strawberries. This manicure gave me a little bit of much needed practice with free-handing a french tip with nail art striping brushes. It turns out I need a lot more practice. To achieve this look, I started out with a french tip of one color, then when it dried I layered another tip under it, almost making stripes of different french tips. 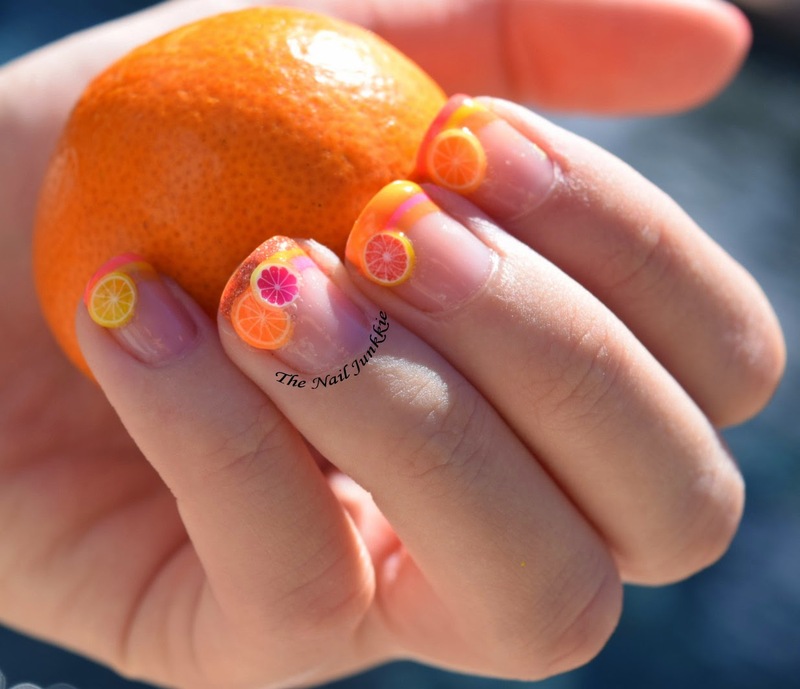 A good coat of top coat and then with tweezers, I placed the fruit slices and put more top coat! 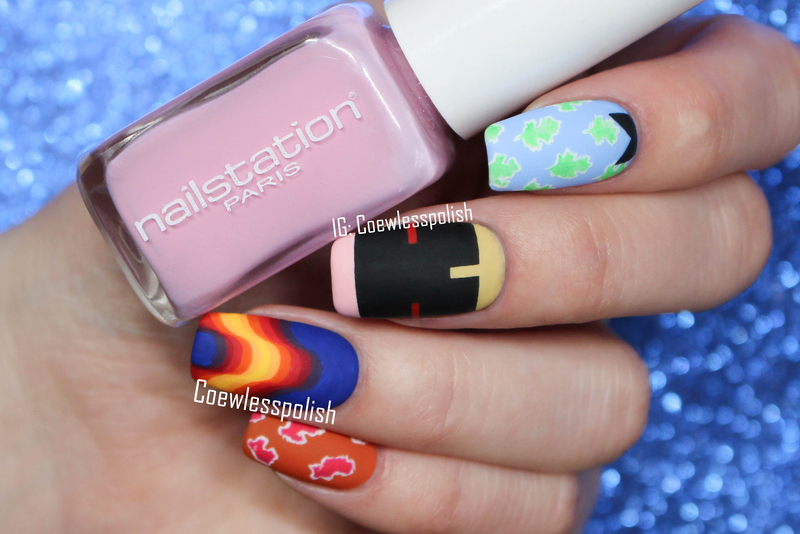 The colors are so bright and fun, and they definitely catch people's eye. At work, at school, and at the car dealership where I was fixing my car, people I was having a conversation with complimented my nails and how cute the fruits were. :) I bought the fruits at the Born Pretty Store on this page. 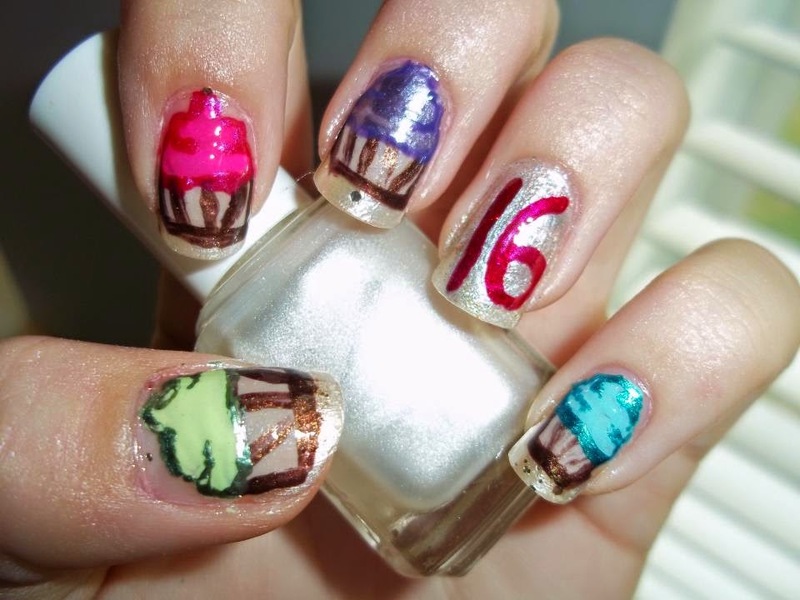 I had my birthday recently, and of course, birthdays are such a great chance to go crazy with manicures! That means: put ALL the sparkles, rhinestones, and anything that sticks! I really went all out this time because usually I only put a bow as an accent, but this time I put something on every nail. 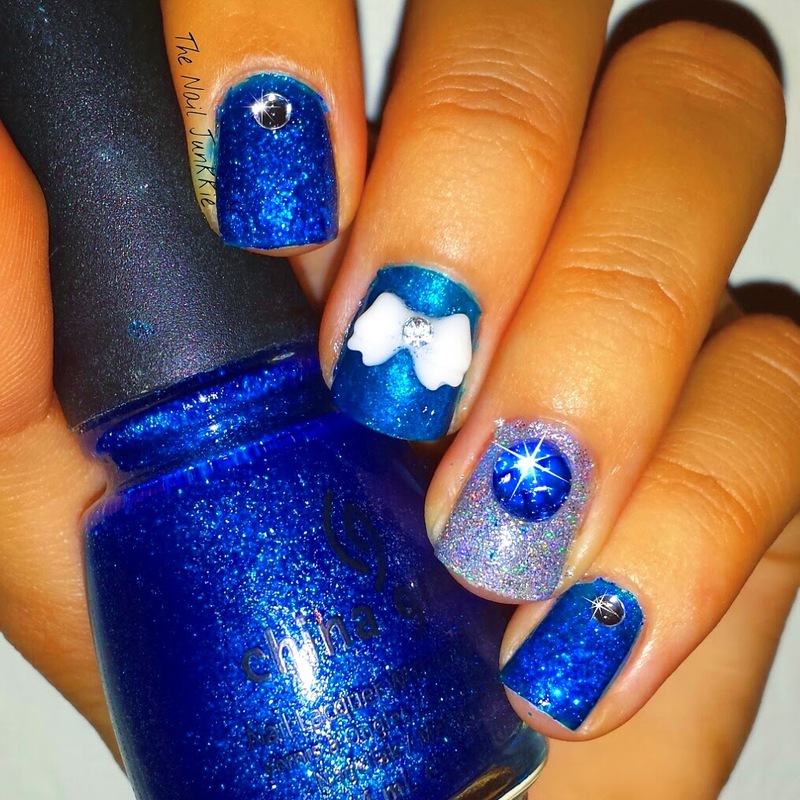 Of course,I used my favorite shades of sparkly blues, plus some loose glitter for some extra bling. And that beautiful holographic microglitter on my ring finger, ahhh soo sparkly. 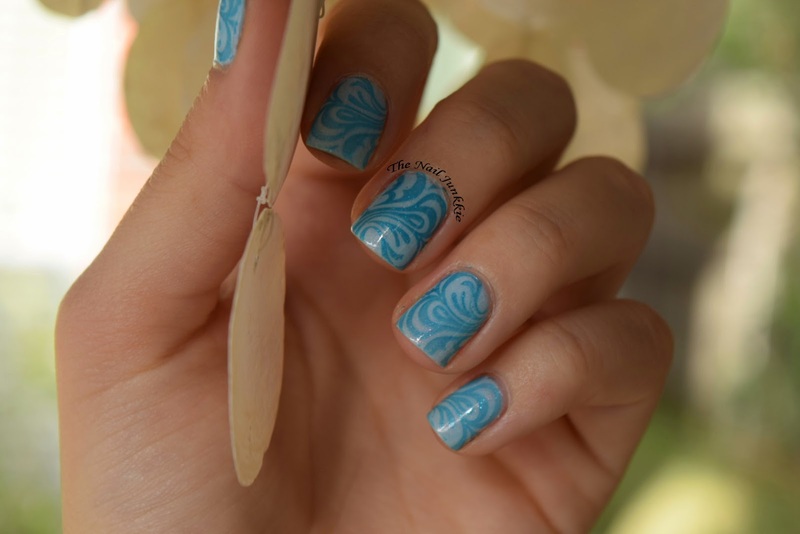 Today I want to share a manicure I did the day before I flew to France! 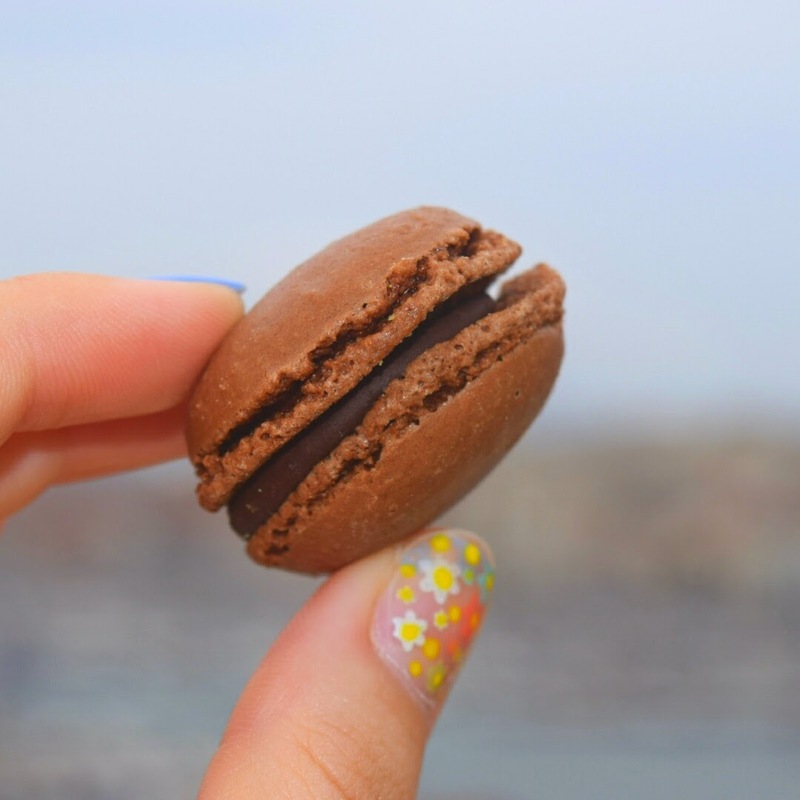 I wanted to have nice painted nails for my vacation this time because I KNEW that I would be taking pictures of Macarons and my fingers would likely be in the pictures. Weird right? I know..
Anyways, that is exactly what ended up happening, and every time we would pass a French Patisserie on the streets I begged my aunt to let me buy one so i could photograph it, then eat it of course. 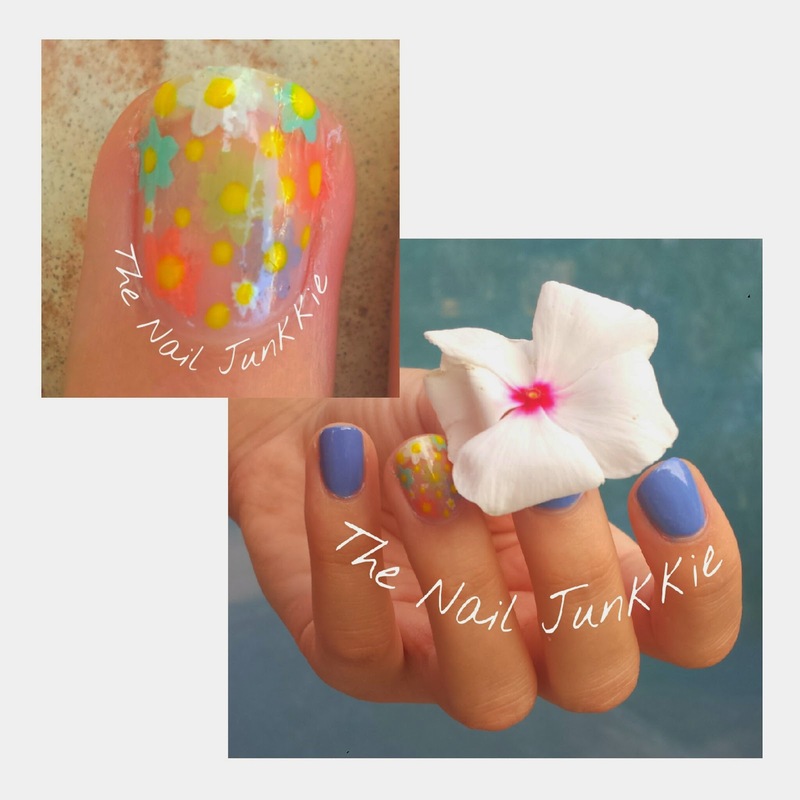 This manicure was done with my favorite Periwinkle from China Glaze, and for an accent nail on my ring finger and thumb I used my dotting tool and different fresh and bright colors to create small flowers, and used a yellow dot to make the center. Hi!! Hope you're all doing fantastic! 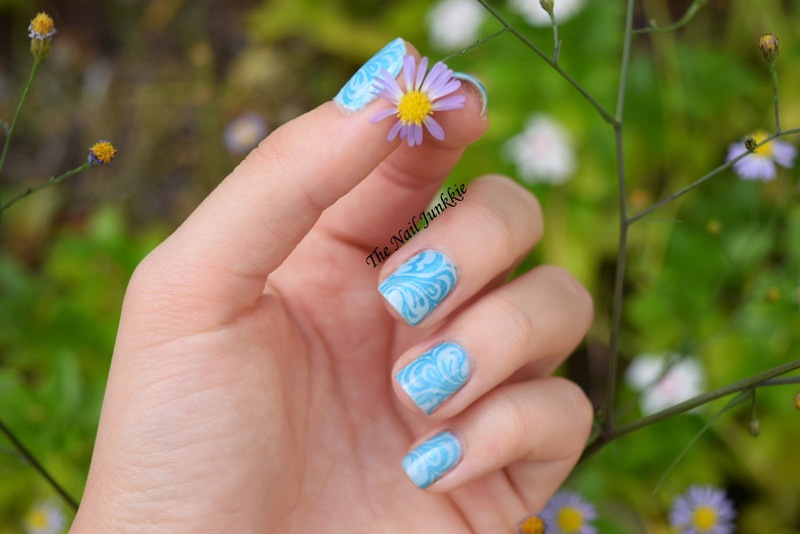 Today, I want to share one of my favorite manicures that I did on myself this summer. 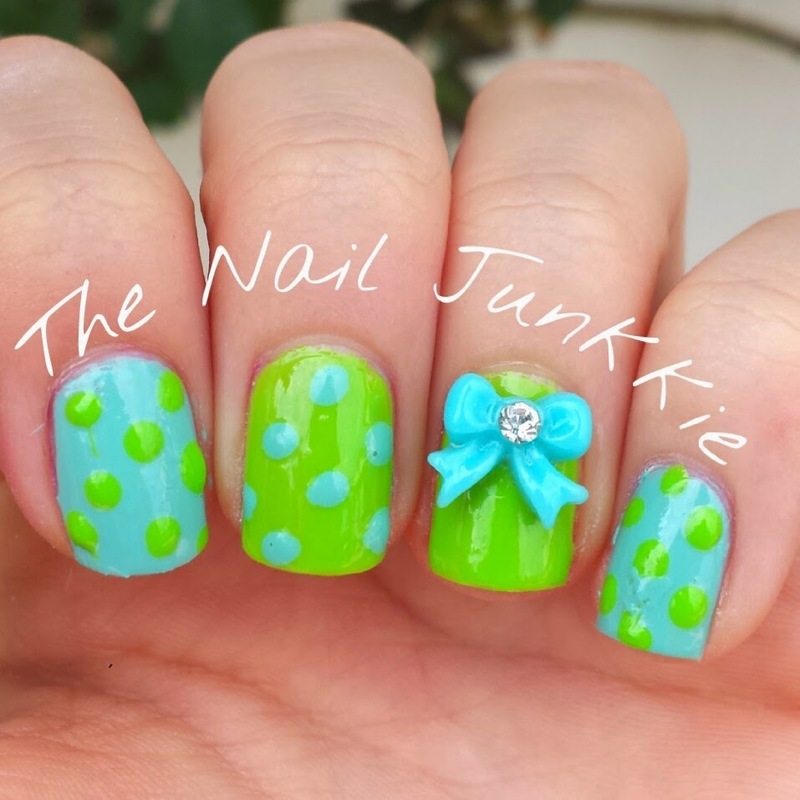 Polka dots in some bright and fresh colors with an accent bow on my ring finger! 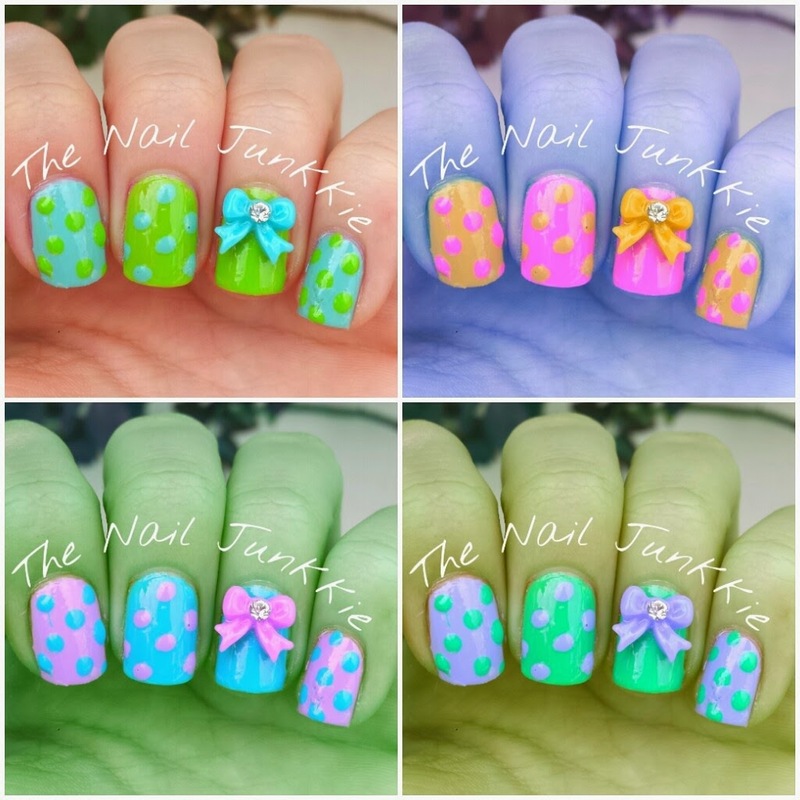 I have an entire pack from Bornprettystore.com of these nail bows in almost every color! So when i'm not really feeling creative I just slap one on my ring or middle finger and call it a day, but anyways they look so cute. Hi guys! Hope you are doing well this winter to spring transition! I can't even believe I'm saying this but...I've had bare nails for over a month!! Crazy right? I got over the trauma of going to school with no nail polish because they were so stained and yellow but im so glad that they have actually become much less stained and have grown way stronger. I'm not sure how much longer I can keep this up because I really miss painting my nails but I do think that maybe I'll go on a no nail polish cleanse every few months because I feel its been beneficial. 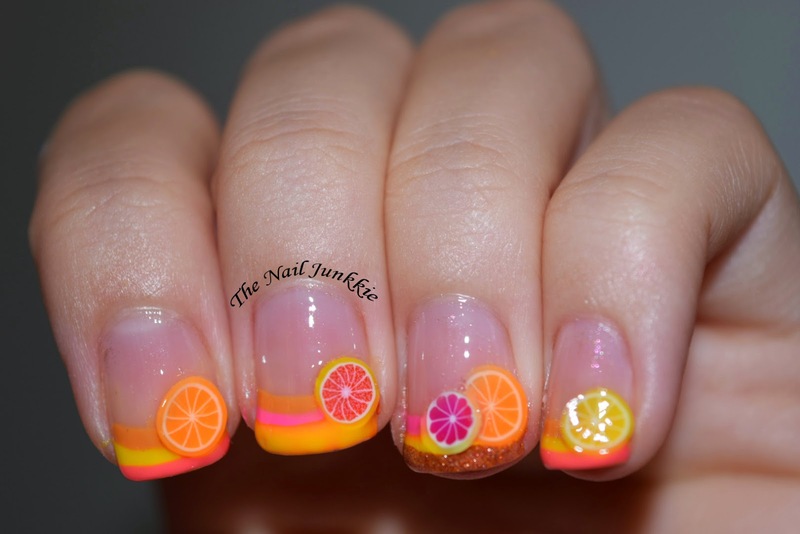 Here are some pics of somewhat older nail designs, have a great weekend!